Until present (June 2007) 489 individuals and fragments of the shower producing fall have been recovered. 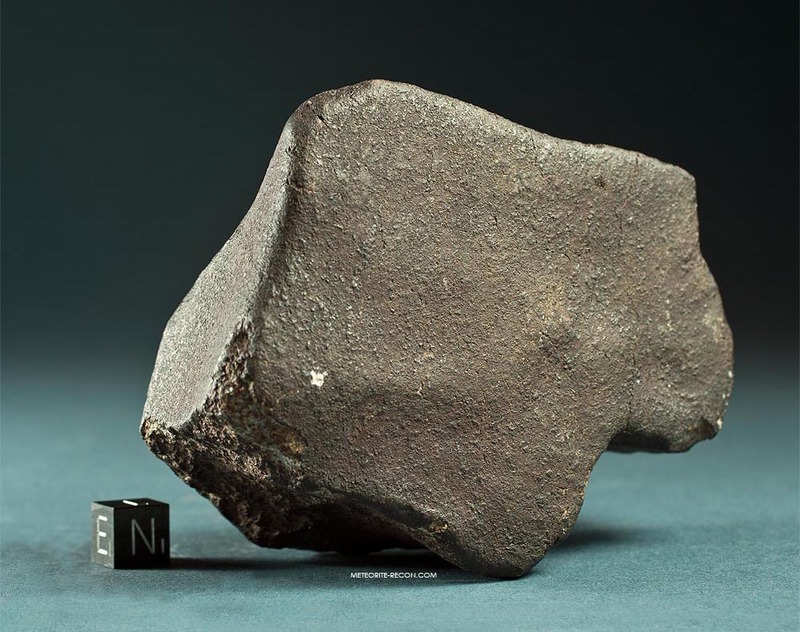 The sizes range from 2 g to 6,120 g. Based on the few available descriptions of the fireball that was perceived as a single object by the eyewitnesses with azimuth towards the entry point, the authors assume that the meteorite entered the atmosphere as a single Body. In the Bassikounou area, the fireball was perceived as “three burning spheres” by 17 eye wittnesses. Two eyewitnesses observed a terminal explosion which marked the beginning of the dark flight. Three to four minutes after the terminal explosion was observed meteorites impacted near and south of Oum Sdeira area. Although no visible signs of a fragmentation event previous to the terminal flash were reported, there is evidence, that at least one fragmentation took place at an earlier stage of the hot flight in which the bolide fragmented into three parts. In total, 324 of the collected masses are individuals covered with thick primary crust representing meteorites with a relatively long history of individual atmospheric flight. This in mind it is most probable that at least one of the three fireballs fragmented before the terminal flash at the beginning of the hot flight. It is mentionable that most of these individuals show partially pronounced fissures indicating that these masses were exposed to a high ammount of pressure stress either from a previous shock event on the mother body or from cumulative stress obtained during the atmospheric passage. As 10% of the collected masses show a thin secondary or a combination of both primary and secondary fusion crust, it can be assumed that the stress fractures have lead to further fragmentation of other individuals. A few of the recovered masses display fractured surfaces showing a minimal degree of heating. This provides further evidence for a final break up at the last stage of the hot flight. All findings together give evidence that single masses fragmented successively along the path of the hot flight. 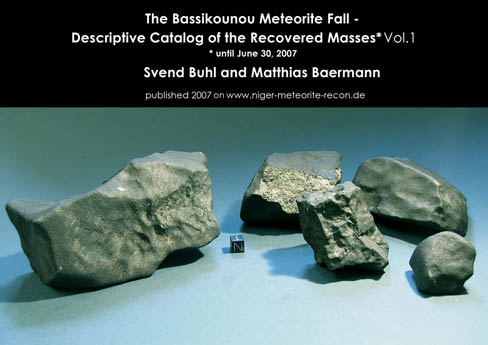 Two thirds of the total mass recovered (Status of June 2007) is concentrated in the range below 3,750 g weight. In total 22 masses with weights > 1 kg have been recovered at present. Most masses with a weight > 500gm display rather angular shapes, with a single shield shaped mass of 860gm being the most prominent exception. Most of the larger masses show regmaglypts at least on one surface, only two of the larger masses show distinct orientation features. Individual masses with weights below 500 gm are predominantly of rounded organic shape. The fusion texture is of a fine grained and velvet like appearance and of dull black colour. 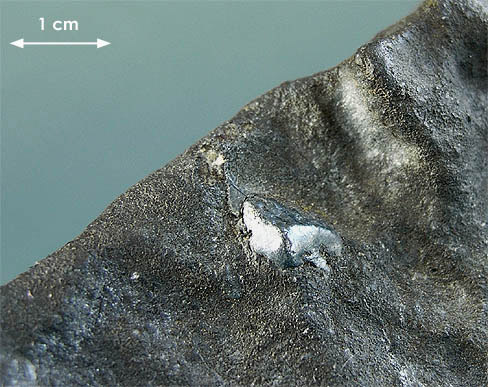 On some meteorites, particularly on those specimens > 500gm, the fusion crust appears “washed” to a brighter ash grey. A mentionable surface feature are the mm sized white or bright grey inclusions which are abundant on surfaces with primary crust on one third of these masses. These are not adherent minerals of soil but consist of different melt products in the same grain size as the components of the other fusion crust and are interwoven with and partly melted over by the latter. About 25 percent of the recovered masses at present (June 2007) show no signs of terrestrial oxidation while the rest displays moderate signs of oxidation and some a slightly smoothened fusion texture. The few rains in the Bassikounou area which fell in December and January have provided enough humidity to aid the oxidation of the meteorites. While some of the larger masses show single surfaces at least largely covered with contraction cracks there are only very few masses with weights <500gm on which they have formed. Different from the contraction cracks are the distinct fissures resulting from pressure stress retained during the atmospheric passage or at a previous shock event. These are often expanding over several centimetres on the surface. Adherent soil is abundant on two thirds of the masses recovered. As mentioned earlier basically three types of soil remnants were found: first, traces of a red to orange laterite and sandstone soil. These occur in the shape of distinct orange to red streaks. Second, a beige clay that is being found in the shape of patches and broader streaks and sometimes contains plant fibres. And finally a pale grey powder like clay that can be found as coating of complete surfaces particularly in the contraction cracks and in the bottom other cavities. One remarkable feature of some 10% of the recovered masses are relatively large concretions of NiFe protruding through the crust. These are surface melted but stick out up to several mm of the fusion crust due to their higher melting point than the surrounding material. They often show flow lines and are of a chrome-blue colour. 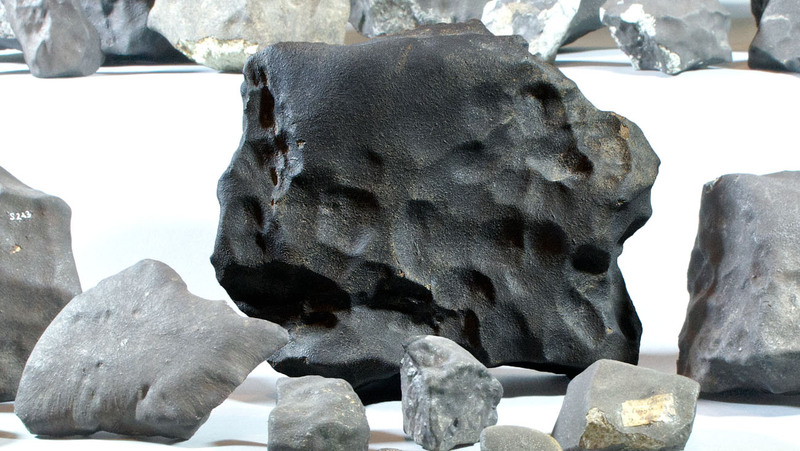 The matrix of the meteorite is colored bright grey with many anthracite colored shock veins running through the meteorite in all three dimensions. The angular appearance of many individuals is due to planar fragmentation along these shock planes. Chondrules cemented in the matrix are abundant in sizes from 0.1 – 1.2 mm with an average size of 0.35mm. The chrome colored NiFe concretions embedded can reach remarkable sizes and sometimes appear in the shape of elongated needles with lengths up to several centimeters. In some cases they show clustering or parallel orientation. On individuals collected in the first two weeks after the fall, there is typically no oxidation visible in the matrix on fractured surfaces. However some meteorites collected briefly after the fall seem to have undergone inadequate handling. These have developed some oxidation while being transported or stored. There is however a slight inconsistency between the dates of October 12 resulting from these measurements and the fall date of October 16 as announced in the local press and as declared in the eyewitness accounts. This inconsistency may be within the tolerance of the gamma-spectroscopy data obtained. 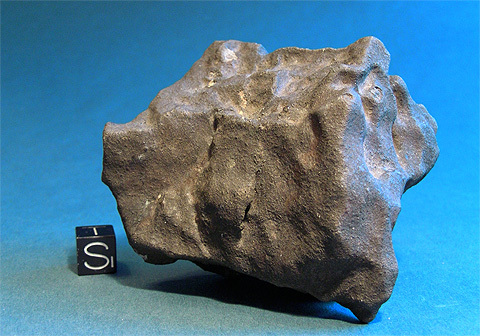 The classification of the Bassikounou meteorite as submitted to the NomCom is that of an ordinary chondrite (H5), with a shock stage of S2 showing no weathering (W0). Prior to the Bassikounou event, a total of eight meteorites plus two crater structures were known for Mauritania. Among those are six finds and only two falls. 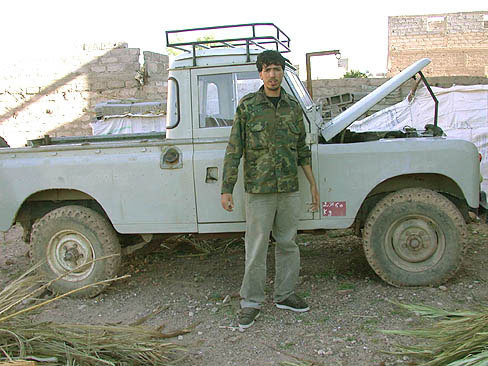 Aioun el Atrouss, a diogenite weighing 1000gm fell at Gounquel in south-east Mauritania on April 17 in 1974. 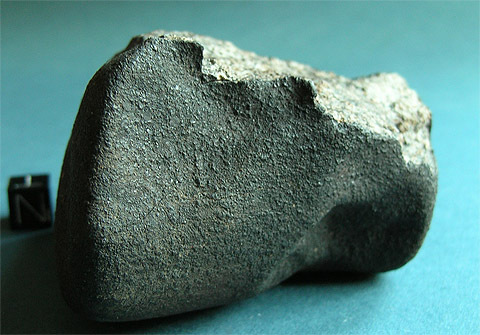 Kiffa, an ordinary chondrite of a TKW of 1500gm fell on October 23, 1970 at 14:55hrs. Bassikounou, the third registered fall in Mauretania is by far the largest and best documented fall in the history of the country. It is known that ordinary chondrites loose between 50 and 85% of their mass due to ablation. The exact loss quotient is depending on initial velocity and entry angle, with maximum ablation beginning in altitudes from 80 to 125km. Unfortunately these required values can not be derived from the fragmentary observations of the Bassikounou bolide. Pending further observation data the authors are at present unable to provide a proof calculation on the initial fallen mass. A large but unknown number of meteorites that were collected is in the hands of Army officials. Neither the individual weights nor the number of meteorites seized and collected by the Mauretanian Army is known. To the knowledge of the authors there is also no data from gamma ray spectroscopy available that would allow to derive the initial mass by different depth production ratios of certain cosmogenic radionuclides. 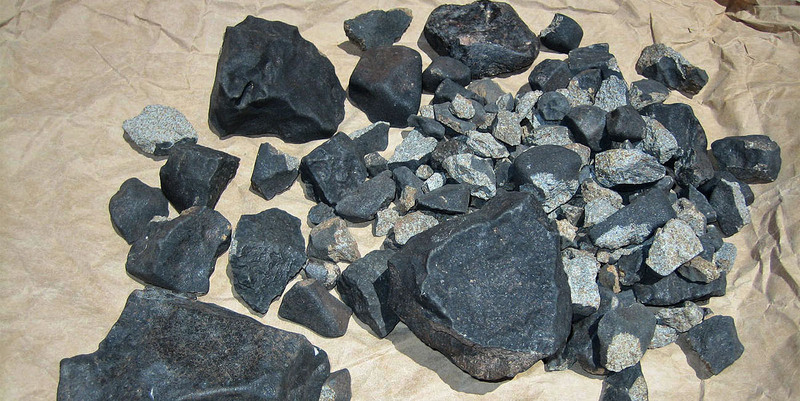 To gather information on the total recovered weight, the mass distribution and the general characteristics of the meteorites recovered the authors approached finders, local citizens, mineral dealers and collectors with a request for information on the masses obtained. 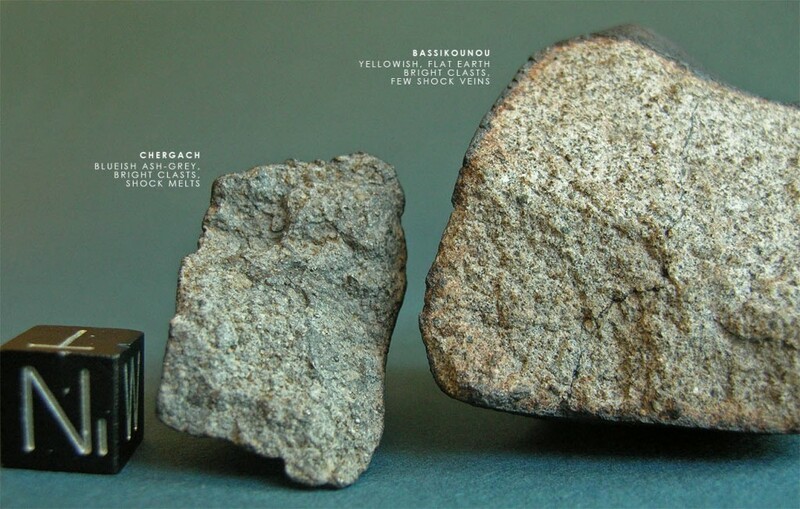 Many owners and dealers in the possession of Bassikounou meteorites answered. At present (June 30) the TKW is 93.85kg. The catalogue (as of July 2007) describes 108 single masses of a combined weight of 62.186kg individually and another 31.665kg in lots. More than 60 individual masses are pictured. The authors are obliged to Dr. Beda Hofmann of the University of Bern, Switzerland and team for their diligent analysis of the Bassikounou material. Further to Hanno Strufe, Germany, for bringing the new material to the light of the public and for sharing his information on the find circumstances of the 3.165kg El Moichine mass. Dieter Heinlein from the European Fireball Network, Germany, was so kind to advise us on the correct interpretation of the fireball observations from Mauretania. With his help the authors were able to assign a fireball sighting from Adrar in Algeria to a different event and exclude a connection with the Bassikounou meteorite. The authors are especially thankful to Prof. Zelimir Gabelica and Tomasz Jakubowski for their tireless efforts to contact French, Belgian and Polish collectors respectively and to forward data on Bassikounou meteorites that were already distributed in private and institutional collections. In Mauretania, we would like to thank our local correspondent Mohamed Yahya Ould Abdel Wedoud, Publishing Director of Peace Newspaper, Nouakshott for collecting eye witness reports on our behalf and for providing background information on the fall area.